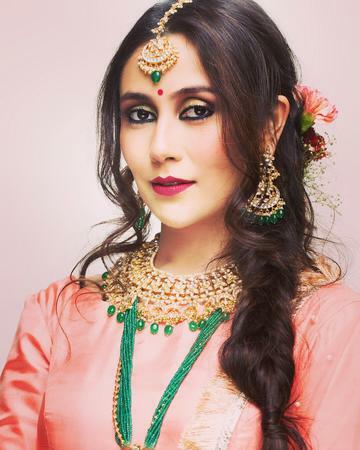 Girl in the Mirror Makeup & Hair by Richa Chugh, Mumbai was started by Richa Chugh who is a professional makeup artist trained under the best-known artists in India and worldwide like Namrata Soni, Clint Fernandes, Cory Walia, Ity Aggarwal and Laurent Philippon. Her style is subtle and classic, and she believes in the philosophy of being your own kind of beautiful. Contact Girl in the Mirror Makeup & Hair by Richa Chugh, Mumbai to discuss your event and makeup needs for your upcoming function. Girl in the Mirror Makeup & Hair by Richa Chugh is a Bridal Makeup Artist based out of Bandra, Mumbai . Girl in the Mirror Makeup & Hair by Richa Chugh's telephone number is 76-66-77-88-99, Facebook page is Girl in the Mirror Makeup & Hair by Richa Chugh and address is Bandra - West, Mumbai.. In terms of pricing Girl in the Mirror Makeup & Hair by Richa Chugh offers various packages starting at Rs 18000/-. Has been viewed 102 times and shortlisted by 0 customers over the last month. There are 0 albums here at Weddingz -- suggest you have a look. Call weddingz.in to book Girl in the Mirror Makeup & Hair by Richa Chugh at guaranteed prices and with peace of mind.